This is an undated, unnumbered and unsigned 12 ½ cent note issued by B. D. Pitts. Virginia Obsolete Paper Money (1992) by Richard Jones and Keith Littlefield has catalogued it under the Private Script and the subtitle Location Unknown. 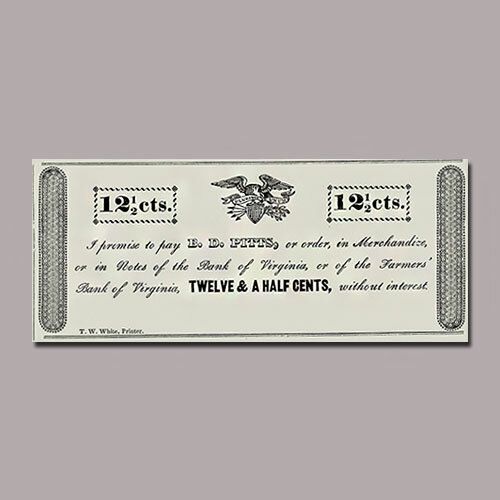 It is redeemable in “Notes of the Bank of Virginia, or of the Farmers’ Bank of Virginia”. The Bank of Virginia was chartered in 1804 and the Farmers’ Bank of Virginia was chartered in 1812. Both these banks were operational till the end of Civil War. One of the experts has discovered that the note was issued in Richmond, Virginia. R. Neil Hening referred to Richmond’s first city directory that was printed by John Maddox. However, B. P. Pitts note was not listed in it. He then referred a directory dated 1845 by K. Ellyson but was unable to find B. P. Pitts again. He then referred printers in Richmond before 1860. The lower left corner of the note features the text “T. W. White, Printer”. After further research, Hening found out that Thomas Willis White was operational in Richmond from 1824 to 1839. He also got to know that White was the founder of the Southern Literary Messenger. Hening is still trying to find out who B. D. Pitts was and what kind of business he was into.